Squared - a glimpse of future search? Google is on the verge of releasing its latest search tool onto its Labs, and Google Squared brings with it a whole host of functionality that will help you pull the information you want from the web. TechRadar visited Google's offices in the UK to have a play around with Google Squared – which is still being tested internally, but is expected to arrive 'soon'. In Google parlance, this is likely to mean a matter of days or weeks rather than months. 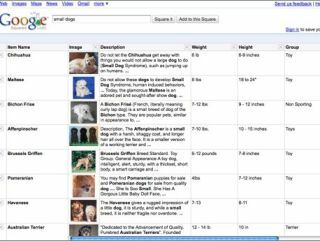 Google Squared as a concept certainly works, instead of returning a list of web pages, it pulls in snippets of information and displays them in a grid so that you can quickly look at the information for a list of products. For example, typing in 'moons' brings in a list of moons, and then auto-populates each moon with information such as discovery date and weight. If you want different information included in the grid, you can delete columns wholesale and replace it with whatever it is you wanted – making comparisons quick and speedy. A note of warning: Google Squared is not a perfect product – it's going into Labs for a reason, and that is that the information that it draws upon is imperfect, biased and occasionally just plain wrong. A search for English counties was wholly unsuccessful, bringing up information that simply was not what TechRadar expected, the search proving too generic and pulling in the wrong things. But changing the search term to 'ceremonial counties of England' was more successful, if far from definitive.